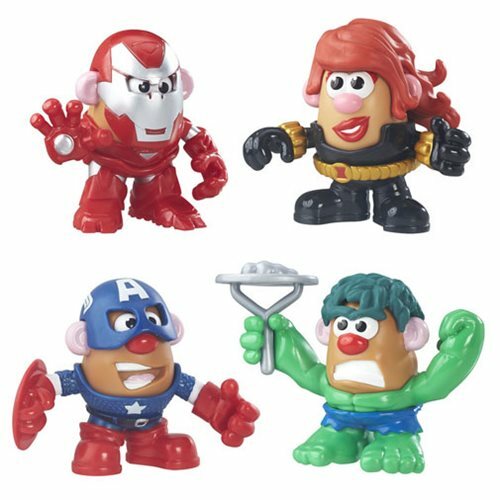 Shopping for Marvel Potato Heads? Big adventure for boys and girls awaits you in the Marvel Mashup Mr. Potato Head 4-Pack! Four awesome mix and mash spuds include pieces to build Hulk, Black Widow, Captain America, and War Machine (subject to change). Each spud measures about 2-inches tall and has their own 3-piece costume. Now that Mr. and Mrs. Potato Head can cosplay as their favorite superheroes, kids are always going to be ready to save the day! Ages 2 and up.